Marcel began volunteering when he was in high school and has given his time and talents to many organizations over the years. After working for 36 years as a CNC operator, it was time for a change. 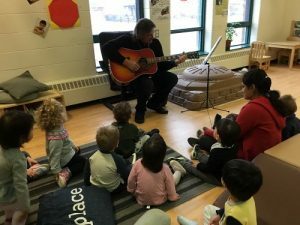 Marcel began volunteering with KW Habilitation’s Early Learning Enrichment volunteer program in 2017. “Marcel has been volunteering in our toddler program and the children adore him. He is kind and gentle when interacting with the children. They love when he brings his guitar to play and sing with them. Story time is also a favourite activity that the toddlers enjoy with Marcel. One of our toddlers was so cautious when Marcel first started volunteering, and now she loves spending time with him, and her parents tell us that she speaks of Marcel at home. Thank you to Marcel and all of our Early Learning volunteers for the amazing work you do!